Of the four major archangels, Uriel is the least known or written about; this can be attributed to two causes. Little literature or commentary exists about Uriel because Uriel is an archangel of non-canonical lore that in early Jewish texts was referred to as Phanuel. Uriel also has a vibration that few humans truly understand. 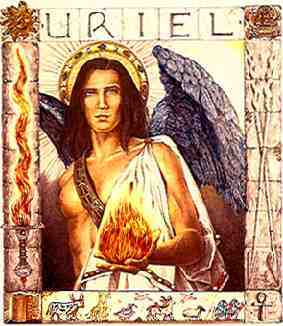 Uriel is Hebrew and means: God is my Light; God is Light; radiation of God; God is the radiating principle of Light; fire of God. When one positions Uriel as guardian of the West (emotions, the heart) one can put in perspective Uriel's unique vibratory pattern and gift to all. Uriel's legendary acts, appellations and symbols become cohesive when viewed from the West. humanity to Love God by using the "fire of God" (by using the fiery sword). Venus, the planet symbolizing love.